Elegant, graceful reclining armchair with great seating comfort. With a modern, striking design, the AIK armchair is sure to become a feature of any room thanks to its sleek silhouette and bold appearance. 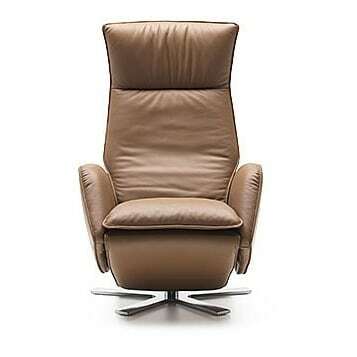 Designed by Georg Appeltshauser, the armchair also offers exceptional seating comfort in any position: whether reclined in front of the TV, upright with the footrest extended for reading, or almost horizontal for the ultimate relaxation, the AIK always offers maximum comfort due to its extra-long leg rest and ergonomic support in the back. Due to its patented mechanic, the Aik chair is endlessly adjustable to any position: whether it’s for upright or casual sitting, active relaxation, or calm unwinding, it can be done without any effort. The back inclination can be changed independently from the foot rest. The surrounding back contour creates a protective shell, while the soft interior offers calm peacefulness: One can simply sink into it and forget about everyday life. In addition, the loosely covered seat cushion with its soft upholstery provides a special charm for the armchair. The endlessly adjustable neck rest offers perfect comfort for the head, while the precious cross base of steel, in high-gloss chrome, or silky matt black, underlines the valuable appearance. Do you have a question about "Aik"? How can we contact you?